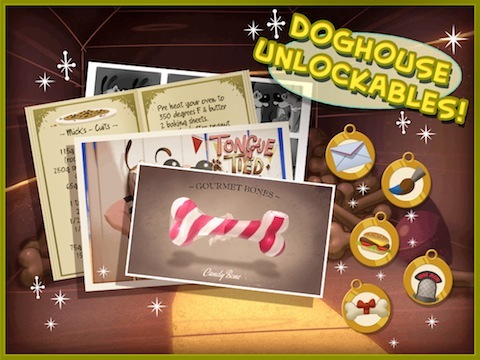 Tongue Tied is a fun new iPad, iPod Touch and iPhone app starring the two dogs Mick and Ralph. 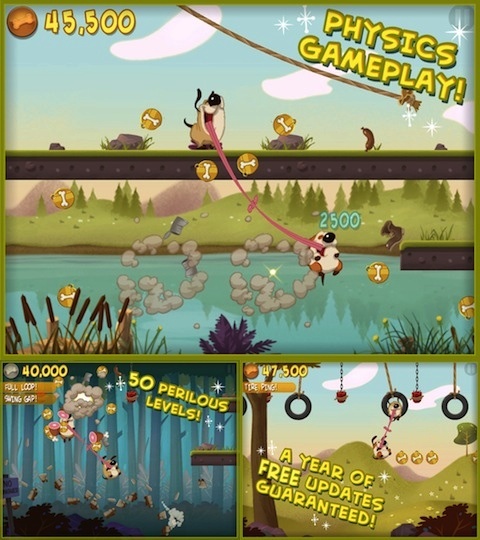 In this application, you have to use physics to properly move the two tongue-tied dogs through tires, mud, jumps and other obstacles. While this game looks like it’s a classic in the making, is it worth your time, or are there some hidden problems that will keep you from finding this app fun? The objective of this game is to keep both Mick and Ralph alive by safely navigating them through leaps and jumps. The story is a little lacking, but this app is meant more for playing than for delivering an in-depth and compelling story. Throughout each stage you can pick up items for points, but the main objective is just getting through the stage alive. The graphics in Tongue Tied are very cartoon like, and it looks great. Mick and Ralph are two big, pudgy goofy looking dogs that you will find hard not to love. They always seem to be smiling at each other, even though they are avoiding dynamite and spike pits. Just like the cartoon graphics, the audio is upbeat and somewhat childish. However, it is difficult to image any other type of music when you look at these two dogs and their world. The songs are very catchy, and you won’t find yourself getting bored while playing. The controls, in theory, are pretty good. Here’s what you have to do. When you want to move, you tap one dog and drag him anywhere on the screen. By releasing him, the dog will slingshot, jump or otherwise move depending on his angle and the length of their tongue. It takes a few seconds to get used to, but there is a tutorial stage that will show you exactly how to launch these two dogs. However, there seems to be some problems with the platforms. A lot of times, when you try to jump near the end of a platform, you will find your dogs falling for seemingly no reason. There are also a lot of jumps that don’t seem to give you enough room to adequately position yourself, which can be very difficult until you learn how to work with these imperfections. While you can move the dogs around the screen, you cannot control their walking. Mick and Ralph will keep walking, and the stage will keep moving, regardless of what you do. This forces you to keep thinking and moving, which isn’t necessarily a bad thing. This app is really fun, and the graphics are great. You are going to find it really hard to not like Mick and Ralph, but when you get a glimpse of the poor platforming physics, it may be hard to look them in the face without getting mad. Some users in the App Store are reporting a crash issue at startup which we did not notice during the review, although Mojo Bones is already reaching out to users to try and address any possible issues. If you have a crashing issue you can post a comment here as well. AppSafari review of Tongue Tied! was written by Darius Reimm on December 22nd, 2011 and categorized under Action, App Store, Arcade, Fun, Games, Physics Based. Page viewed 3699 times, 2 so far today. Need help on using these apps? Please read the Help Page.